Abstinence works: A personal story from the Texas Gov. Statistics show that Texas is ranked third in teen pregnancies and first in repeat pregnancies (not to mention first in spending federal dollars to teach abstinence only). But Texas Govna Rick Perry don’t like statistics. He prefers some personal anecdotes to set the record straight. 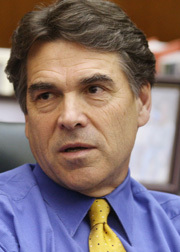 On my own personal note, I’d like to hear more about Perry’s abstinence experiences. Please share, Govna.